The JV Soccer matches vs. East have been cancelled for today and will be rescheduled for Tuesday, April 16, 2019 boys JV at 4:00 p.m. and girls JV at 6:00 p.m. at Central. 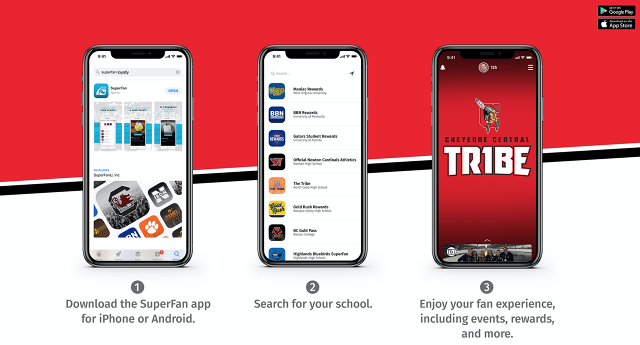 The Central SuperFan App is now available for IOS and Android. Download and check in at Central Events to earn points and start to claim prizes. Central will be using an automated streaming system to stream events from both the Central Fieldhouse and Riske Field. This service will be free again this year, as the Laramie County Recreation Mill Board has graciously approved the covering of the cost for the service. You must have an account through the NFHS Network. Please follow the instructions below to set up that account. We will also try to publish links to the streams on this site. Please email Mr. Whitworth at chad.whitworth@laramie1.org of you have any questions. Please click on the link below to access some information on competing in college athletics. Information includes course work requirements as well as information on where to register with the NCAA and NAIA.